A fistula is an abnormal communication between two epithelial-lined surfaces. An atresia refers to complete obliteration or absence of an orifice of a hollow organ. A stenosis is change in diameter of a hollow organ to become narrower. It can also be called stricture. A tracheoesophageal fistula, as the name implies, is an abnormal communication between the trachea and esophagus. Congenital tracheoesophageal fistulas are usually diagnosed at birth or soon thereafter. Esophageal atresia with distal tracheoesophageal fistula is seen in up to 86% of the cases. It is the most common type. Isolated esophageal atresia without a tracheoesophageal fistula. This type is seen in approximately 8% of the cases. Isolated tracheoesophageal fistulas come in third place in frequency and are diagnosed in 4% of the cases. Esophageal atresia with a proximal communication represents 1% of tracheoesophageal fistulas. Esophageal atresia with proximal and distal communications represents 1% of tracheoesophageal fistulas. The estimated incidence of congenital tracheoesophageal fistulas is around 1 in 2,000 to 4,000 live births. There are no racial differences and the incidence is equal in both genders. Most newborns with congenital tracheoesophageal fistulas are diagnosed during the neonatal period because of the emergence of severe complications. In fact, the diagnosis of a congenital tracheoesophageal fistula is most commonly made at birth. The prognosis of infants who had a congenital tracheoesophageal fistula surgically repaired is excellent with a 100% survival rate. If early surgical repair is not possible, the survival rate can drop by 10 to 20%. Despite an excellent survival rate, infants are at risk of developing several morbidities after the repair of the tracheoesophageal fistula. Esophageal dysmotility, gastroesophageal reflux and dysphagia are commonly seen. Recurrent pneumonia is another common complication of tracheoesophageal fistulas. Tracheomalacia has also been reported to be more common in infants who had a tracheoesophageal fistula. Certain genetic disorders and environmental exposures have been linked to an increased risk of congenital tracheoesophageal fistulas. Trisomies 18, 13 and 21 have been associated with tracheoesophageal fistulas. Additionally, the use of the decongestant imidazoline in the first trimester has been linked to an increased risk of congenital tracheoesophageal fistulas. In most cases, however, a single etiology cannot be identified. Tracheoesophageal fistulas are usually associated with multiple anomalies that can affect the survival of the child. Cardiac malformations (patent ductus arteriosus, atrial septal defect, or ventricular septal defect in 25%). They are commonly seen in children with congenital tracheoesophageal fistulas. Renal anomalies (urethral atresia with hydronephrosis, renal agenesis, horseshoe kidney, polycystic kidney). Limb anomalies (hexadactyly, humeral hypoplasia, radial aplasia, and proximally placed thumb). Tracheoesophageal fistulas can also be associated with a duodenal atresia, malrotation of the gut, Meckel diverticulum and annular pancreas as well. These associations suggest a common pathophysiology or etiology between these different malformations. This association is closely linked with errors in the embryonic period as the respiratory system outpouches from the primitive foregut. During embryogenesis, the primitive foregut gives rise to a ventral diverticulum which evolves into the trachea. This event usually starts happening in 4 to 6 weeks after conception and is also characterized by the fusion of the tracheoesophageal folds to form a ventral laryngotracheal tube and a dorsal esophagus. This process is usually impaired in children with a tracheoesophageal fistula as the septum between the two tubes fails to form at some point. Esophageal atresia, a key component in most types of tracheoesophageal fistulas, can be diagnosed prenatally. Maternal polyhydramnios is usually evident in most cases and prenatal ultrasonography can reveal the stomach’s gas absence. During the neonatal period, the most common presentation is the development of copious amounts of white frothy bubbles in the mouth and nose. These bubbles recur despite repeated suctioning. 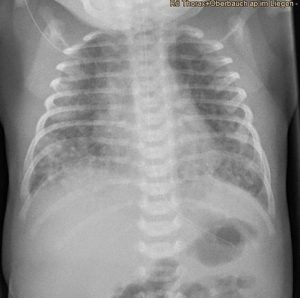 Infants with congenital tracheoesophageal fistulas usually present with respiratory distress symptoms and recurrent pneumonia. Coughing, choking and cyanosis can be seen in an infant with a congenital tracheoesophageal fistula, especially during feeding. Most TEF present almost immediately after birth. Food cannot get to the stomach, resulting in immediate emesis and rapid dehydration. Gastric contents may enter the lungs, resulting in respiratory distress. The main goal of a physical examination in an infant with a tracheoesophageal fistula is to exclude any of the previously-mentioned anomalies that can be associated with this congenital malformation. Laboratory investigations are not useful in establishing the diagnosis of a congenital tracheoesophageal fistula. Prenatal and postnatal imaging studies are the main diagnostic tools to establish the diagnosis of a tracheoesophageal fistula. 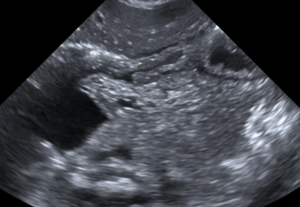 Prenatal ultrasonography can reveal polyhydramnios, the absence of gas in the stomach, a distended esophageal pouch and in-utero growth retardation. These findings are indicative of esophageal atresia and not a tracheoesophageal fistula per se, but, because esophageal atresia is seen in most cases of tracheoesophageal fistulas, establishing the diagnosis on the confirmation of an esophageal atresia is reasonable. 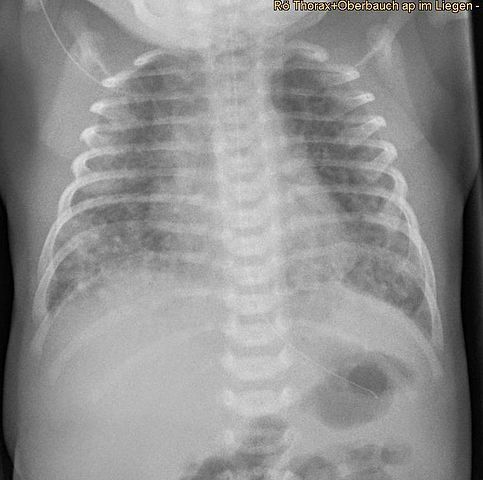 Neonates or infants with a congenital tracheoesophageal fistula should undergo chest X-ray imaging to exclude complications such as aspiration pneumonia and to have more clues to confirm the diagnosis. 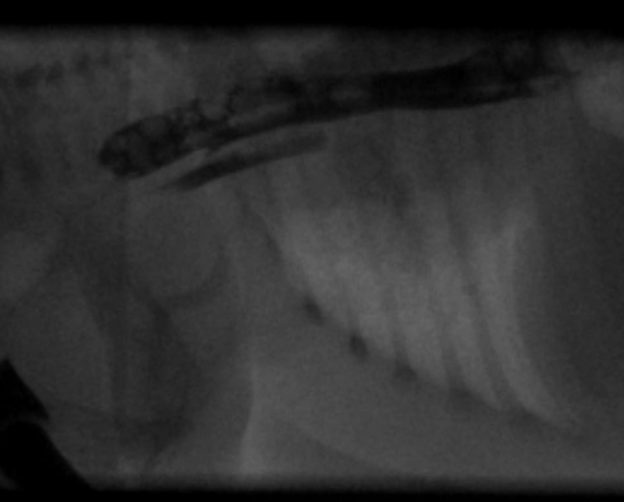 The most common findings on a chest X-ray are tracheal compression and deviation, or the absence of a gastric bubble. A nasogastric tube might be inserted to confirm the diagnosis of esophageal atresia. When esophageal atresia is present, the nasogastric tube will coil in the mediastinum and one would visualize the radiopaque line of the catheter. Multidetector-row computed tomography scans can be used to confirm the diagnosis of a tracheoesophageal fistula without the use of a contrast medium. Because of the non-invasiveness of the procedure, computed tomography scans become preferable by most pediatric surgeons to plan the repair procedure for tracheoesophageal fistulas. It is essential to transfer any neonate or infant who is diagnosed with a tracheoesophageal fistula to a pediatric hospital that has experience in the surgical repair of tracheoesophageal fistulas. The early repair of the fistula has been associated with an excellent survival rate. Surgical repair can be delayed in neonates with very low birth weight or aspiration pneumonia. All other healthy infants should be provided primary surgical repair of the fistula within the first few days of life; however, this may not be possible depending on the nature of the lesion (distance between the segments) and the clinical status of the neonate, thus, several surgical approaches have been adopted. Primary ligation of the fistula and anastomosis of the esophageal segments if the distance is not too great. 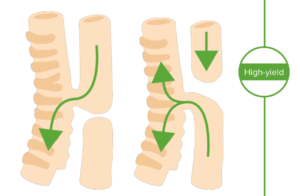 Two-stage procedure in instances where the ends of the esophagus cannot be brought together. The initial surgery entails fistula ligation, esophageal stoma, and a gastrostomy fashioning. The neonate should be breastfed, and the milk let out through the esophageal stoma (sham feeding) to allow for the baby to learn how to breastfeed while actual feeding is done through the gastrostomy tube. The second surgery involves anastomosis of the esophageal segments after growth in length. Gentle stretching of the esophageal segments before later anastomosis may be beneficial, or repair by interposing a segment of colon between the esophageal segments may be required. Echocardiography should be performed prior to surgery to rule out a right-sided aortic arch which would lead to preference of a left-sided thoracotomy instead of a median sternotomy approach. A cuffed endotracheal tube should be placed distal to the fistula to prevent aspiration during the operation. Once the fistula is repaired, care must be taken to prevent gastroesophageal reflux and prolonged mechanical ventilation as they were associated with an increased risk of recurrent tracheoesophageal fistulas. The tube in the proximal pouch should be placed on continuous suction to drain secretions and prevent aspiration. The head of the bed should be elevated to prevent reflux of gastric contents through the distal fistula into the lungs. Intravenous glucose and fluids should be provided, and oxygen administered as needed. Use of a tracheostomy if the difficulty in breathing and cyanosis is not alleviated by the above measures. Despite an excellent survival rate, infants are at risk of developing several morbidities after the repair of the tracheoesophageal fistula. Esophageal dysmotility, gastroesophageal reflux and dysphagia are commonly seen. Recurrent pneumonia is another common complication of tracheoesophageal fistulas. Tracheomalacia has also been reported to be more common in infants who had a tracheoesophageal fistula. Sharma S. Tracheoesophageal Fistula. Background, Pathophysiology, Etiology. http://emedicine.medscape.com/article/186735. Published February 7, 2017. Accessed May 1, 2017.